From today onwards we’ll be presenting you all Stadium of the Year candidates, each as a separate reason to vote, perhaps precisely for that stadium! We begin with A for AFAS Stadion. Not the one in the Netherlands, rather the more unique one in Belgium. They’re both similar in terms of size, but this one is much more old school. And not in a bad way. Surely, Achter de Kazerne (as it’s commonly known) is not a perfect stadium, especially in its previous layout. But after bulk of the ongoing regeneration was delivered in the summer of 2016, it’s a worthy nominee. And we can bet there are football fans in the United Kingdom who would wish to have such a charming stadium. Irregular layout, full cover of spectator areas and large, safe terracing in the old paddock style, despite being shiny and new. And it’s not just the old-school terraces for more traditional spectators. The stadium’s two new stands also offer room for families and roughly a dozen (flexible number) skyboxes with comfortable chairs for the “prawn sandwich brigade”. And all that in compact and robust composition. One thing the two new stands miss is a decent section for the disabled, but a brand new covered wheelchair platform is in the making right now. 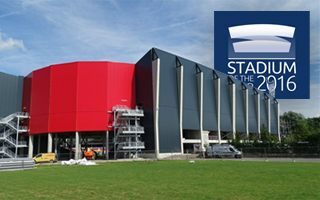 With total budget around $10 million, Mechelen’s stadium revamp is what we might set as an example for some European cities. Those with high football aspirations and limited financial capacity. It’s cost-effective and the quality of infrastructure created is very satisfying. And one more thing. This stadium doesn’t only have additional hospitality/banqueting facilities created (finishing works ongoing now), it also has room created with kindergarten in mind. Not operating yet as far as we know, but a very good idea of how a taxpayer-owned stadium could serve the local community on weekdays.